Wreaths are one of my favourite things to make in floristry. They can be neat and formal, or, as I like mine, a bit wild and rustic with twiggy bits poking up above the foliage. 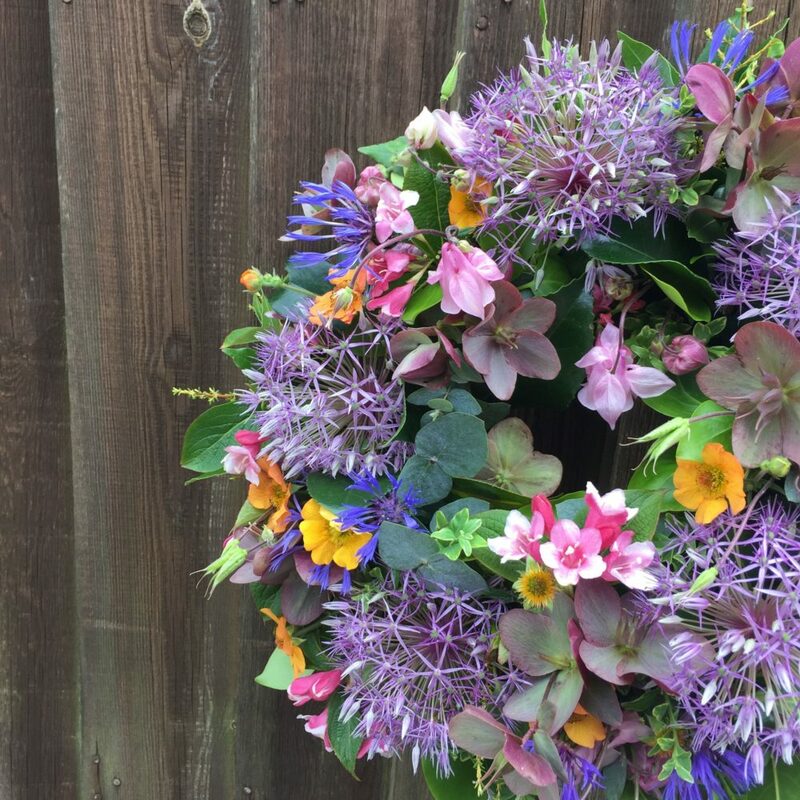 They can be used for so many occasions: as a table centre for a wedding or a Christmas table, they can be hung on a front door at Christmas to welcome your visitors or they can be a beautiful floral tribute at a loved one’s funeral. 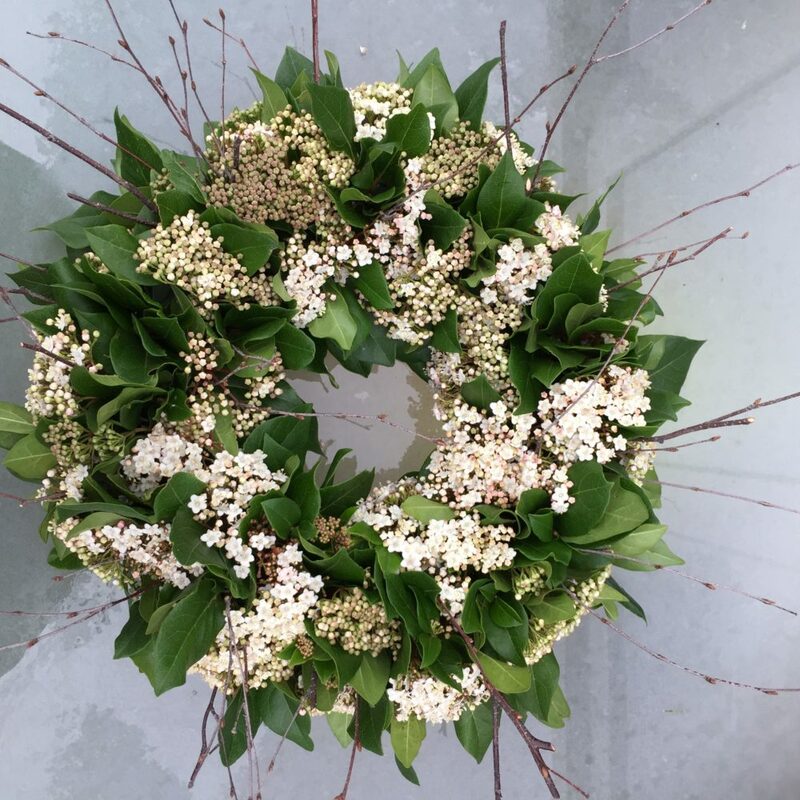 At its simplest a wreath can be a few willow or birch twigs twisted together and tied with raffia. 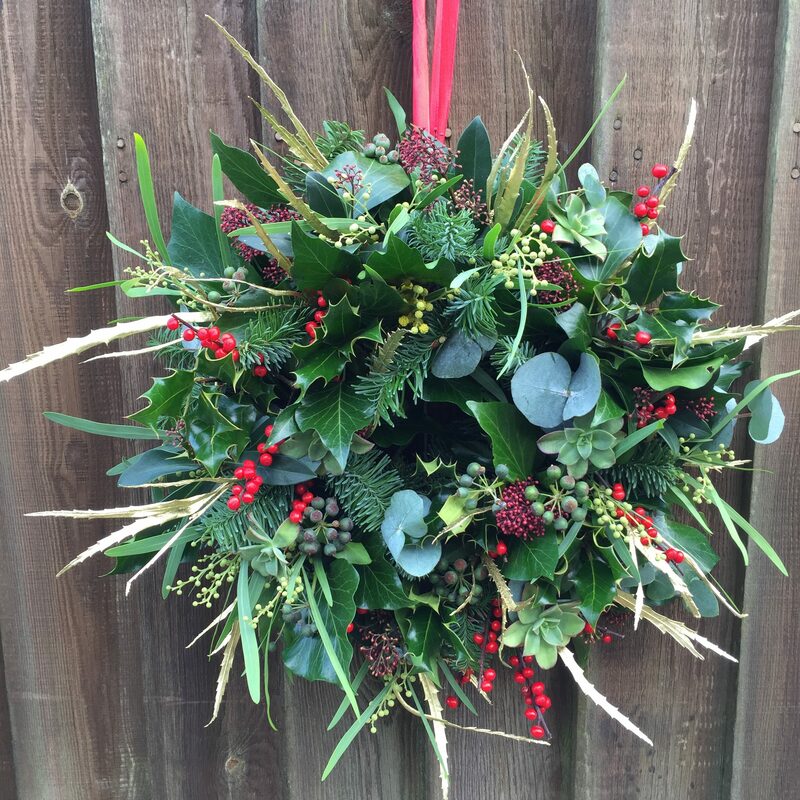 A ring of evergreen foliages such as eucalyptus and fir with a hessian bow can be a beautiful decoration for a door. 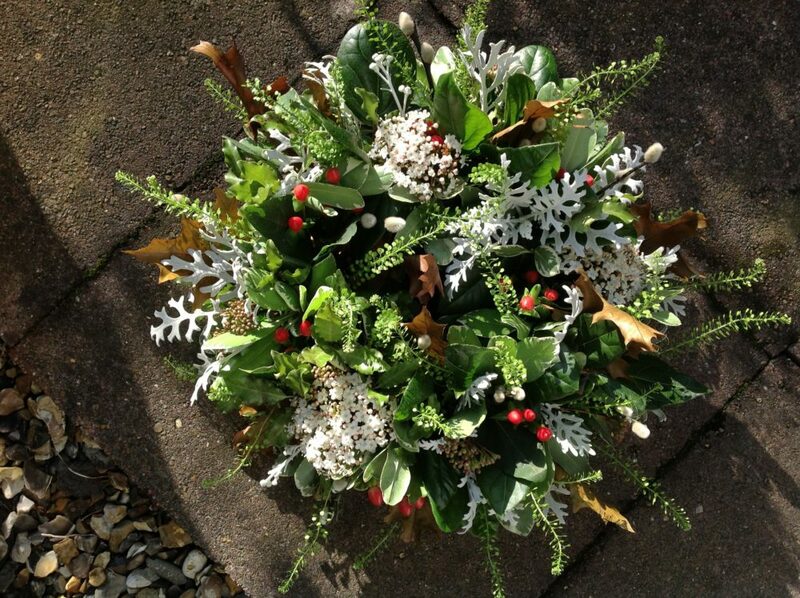 This one’s a circle of birch twigs with mistletoe sprigs attached. The most usual time to have a wreath on the door is Christmas. A glossy front door can look very stylish with a traditional wreath made of evergreen foliages, holly berries, cones, feathers, cinnamon sticks and fruit slices. Wreaths are not just for Christmas! 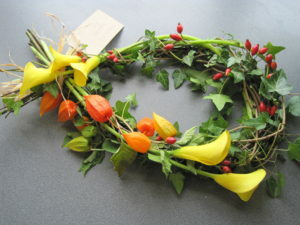 Easter or spring wreaths with spring flowers, bulbs and catkins are popular, as are autumn wreaths with red and gold leaves, nuts, twigs and berries. 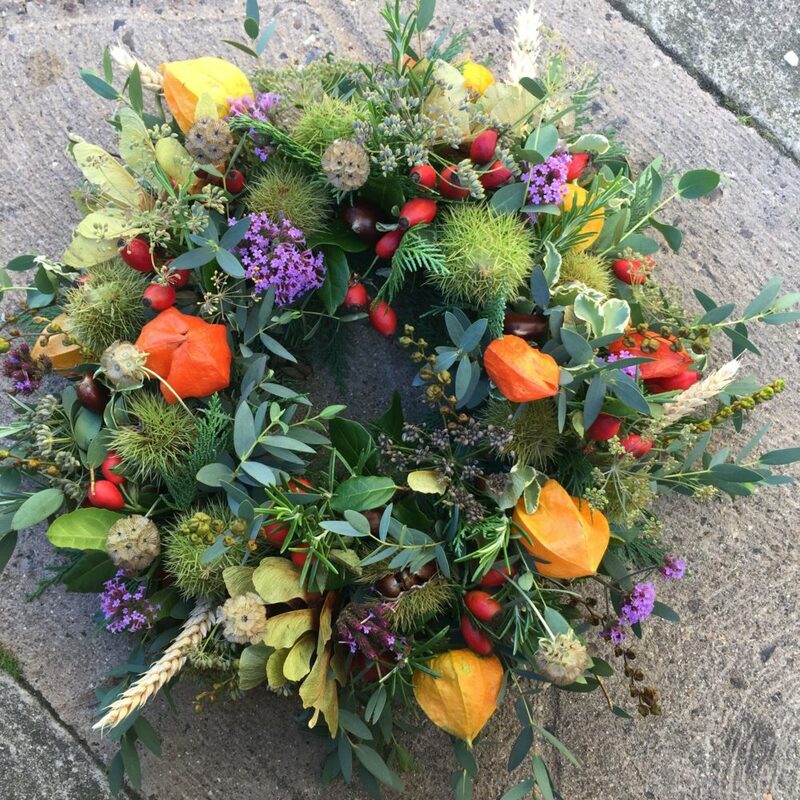 A lovely autumn walk in the country can yield many foraged materials for a glorious autumn wreath, like sweet chestnuts, rose hips and old man’s beard. A wreath can also look lovely as a table decoration for a party or wedding, with a hurricane lantern and candle in the middle. Flower heavy with roses and hydrangeas and they can look very luxurious on tables at a wedding reception. If a biodegradable wreath is required then wire frame is replaced by a ring of willow and covered with moss. 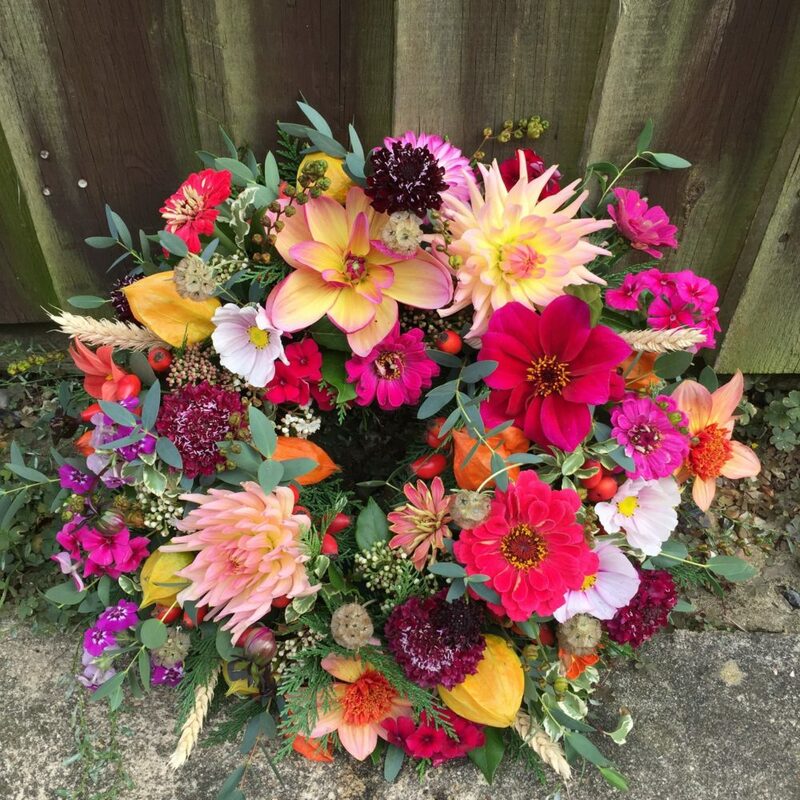 These can be lovely for a funeral tribute at a woodland burial ground. The circle of the wreath represents the circle of life. There are so many ways of decorating a wreath, you can really get creative and make something really seasonal and unique. Back in the spring I approached the local farm shop to see if they’d be interested in me doing a pop up flower shop for Mother’s Day. 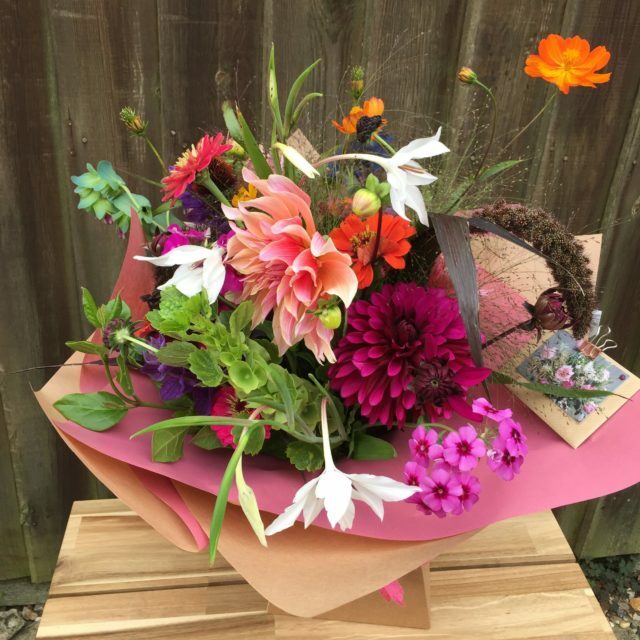 I made hand tied bouquets of lovely Cornish and locally grown spring flowers, all wrapped up beautifully in kraft paper and gift boxed. 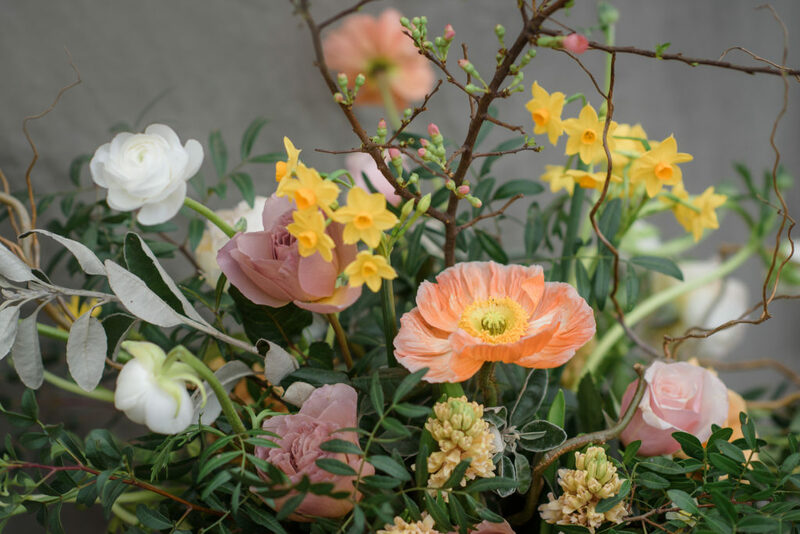 I used fragrant Cornish narcissi in cheerful shades of yellow, white and orange and lovely mixed tulips together with Cornish eucalyptus, osmanthus and willow twigs. In the chilly days of early spring they certainly made a splash of colour and a gorgeous scent. 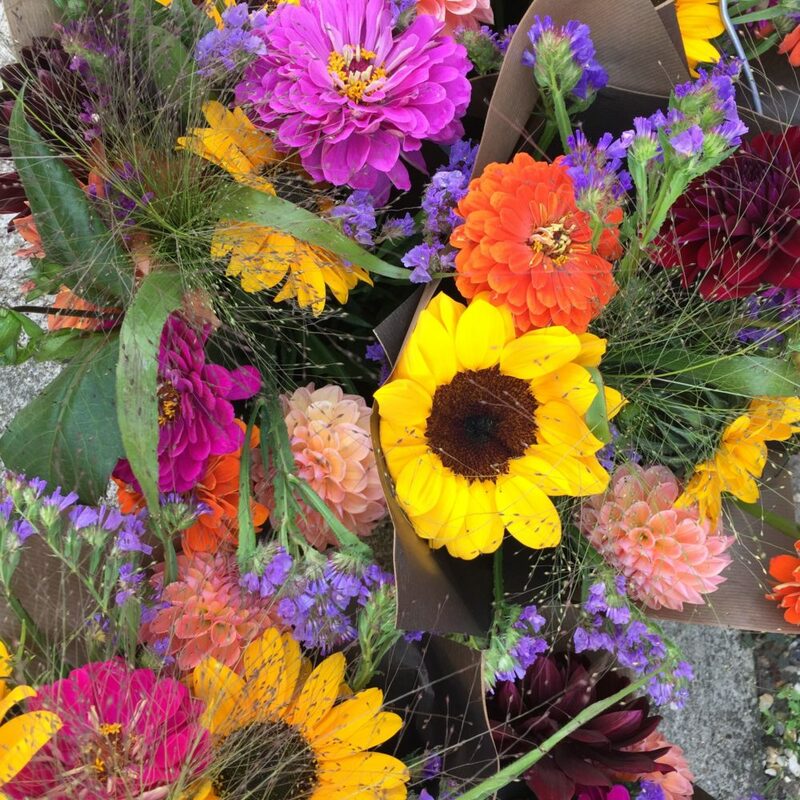 Following on from this I made “pick up and go” bunches of local, seasonal flowers to have on sale every week from Thursday to Monday. At £7.50 a bunch they made a nice little gift to say “thank you”, well done” or “thinking of you” or maybe just as a treat for the purchaser. Each week’s selection of flowers was different from the last so regular buyers always got something different. 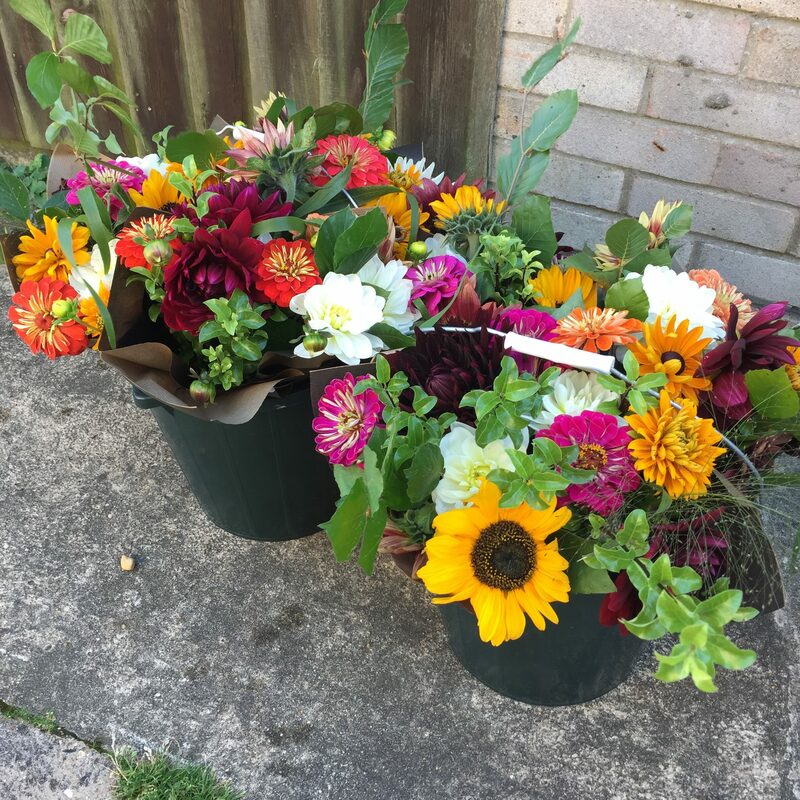 The images here are of some of the farm shop bunches I’ve sold throughout the year starting off with spring bulbs right through to the dahlias, zinnias and sunflowers which are blooming now in such profusion. As autumn arrives the varieties and volume of local flowers are gradually reducing. Soon most of the growers I buy from will be hunkering down for the winter, planning for Christmas and planting for next spring. It’s still possible to get British flowers even in the winter months. Early Cornish narcissi, anemones and luscious foliages are already available and will be right through to the spring. These will be followed by tulips, indoor grown alstroemerias and sweet Williams. I hope to continue using British flowers and foliages throughout the year. I’m sure there will be times when it’ll be a challenge but I’m pretty sure it can be done! 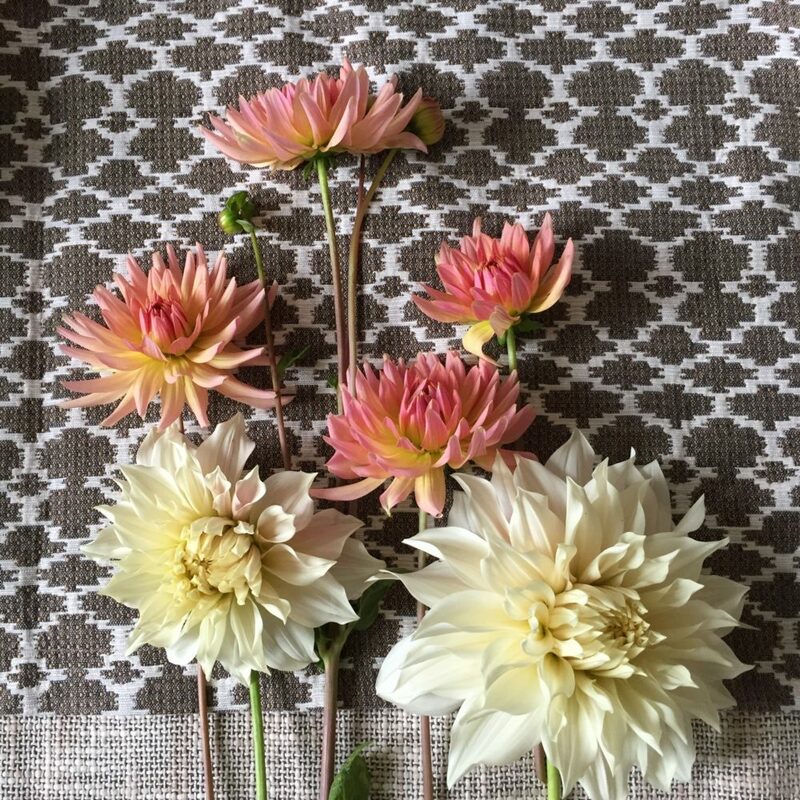 I’m proud to be a part of the British flowers movement which has had plenty of national press this year, showing consumers how amazing British flowers and foliages are. For so long imported blooms have become the norm and although all flowers are beautiful no matter where they come from, I do feel passionately about using “home grown.” Less flower miles from field to market, less use of chemicals for growing, more unusual flowers and more fragrance in flowers can only be a good thing! 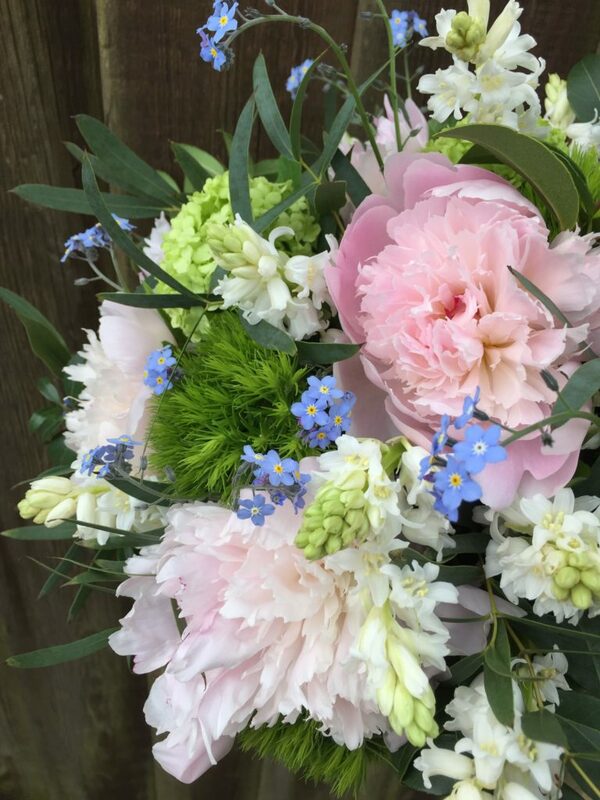 I’m lucky to have the choice of several local flower growers to buy my flowers from, together with a wholesaler of British grown flowers in the West Country. 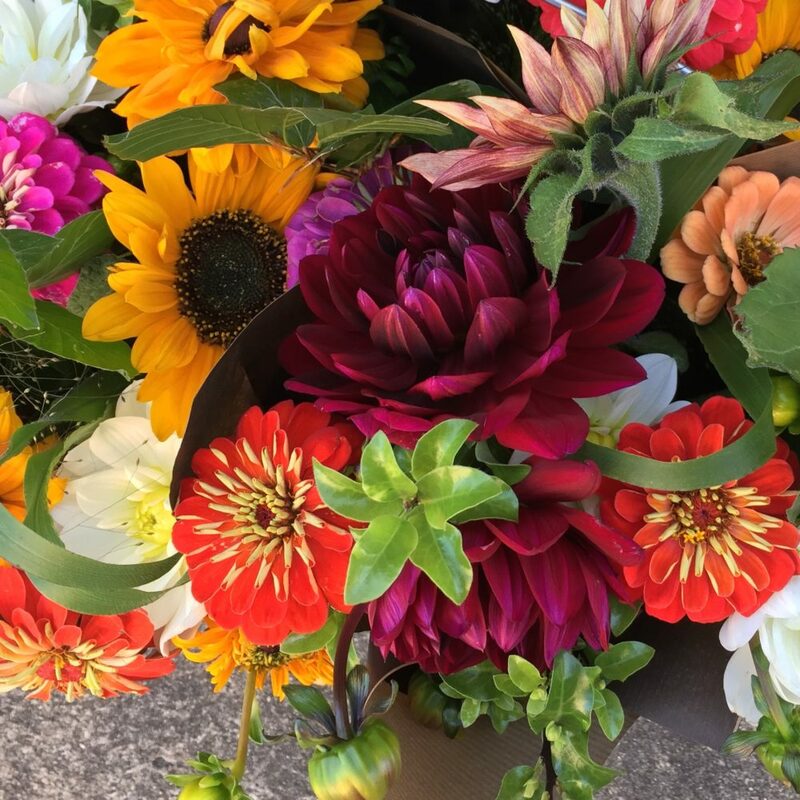 I like to have plenty of different flowers in my bouquets and to this end I quite often order my flowers by the mixed bucket. I might ask for particular colours or I may leave the choice up to the growers. For a florist this can be quite a challenge as you never know what you’re going to get! But that’s good! 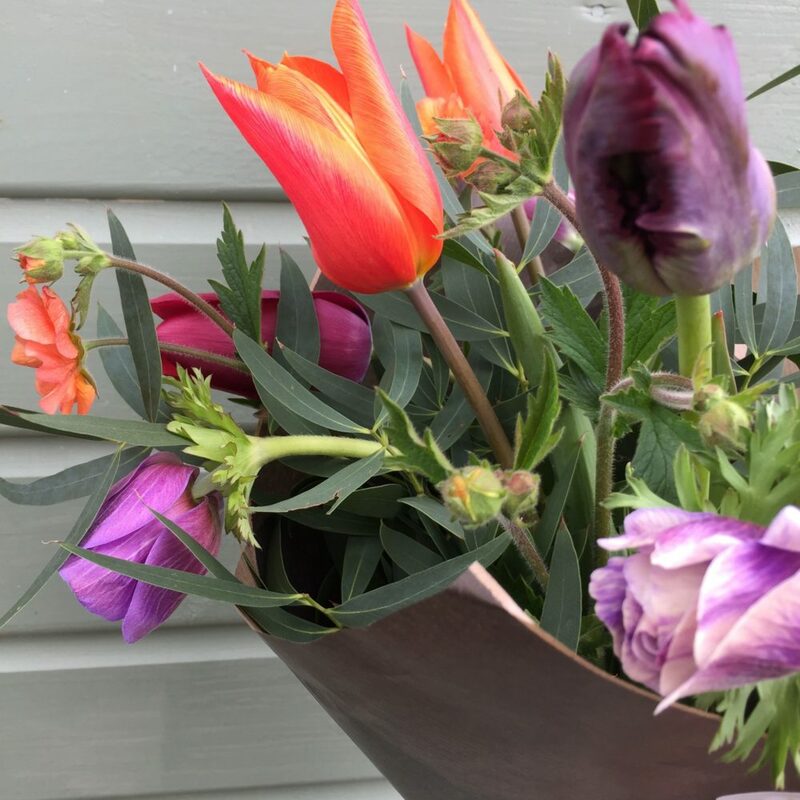 As I took delivery of a bucket full of blooms recently it struck me that the bucket contained a beautiful mix of what was best in the garden at that moment. The bouquet I made was really a representation of “the summer garden in a bouquet”. I really like this idea as it means the bouquet is full of textures, different colours, shapes and scents. 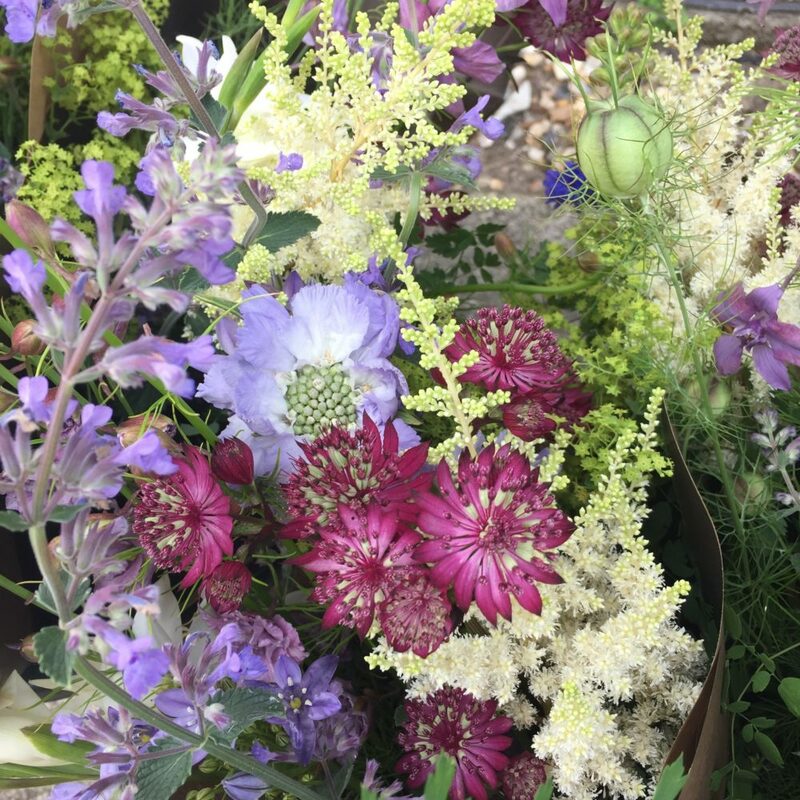 Most British flower farmers use as few chemicals as possible in growing their flowers, so their fields are always buzzing with the sound of bees and other insects pollinating the flowers. Whilst I was photographing one bouquet recently a bee flew into the flowers to collect nectar. For me that’s what it’s all about, growing beautiful blooms whilst showing respect for nature. 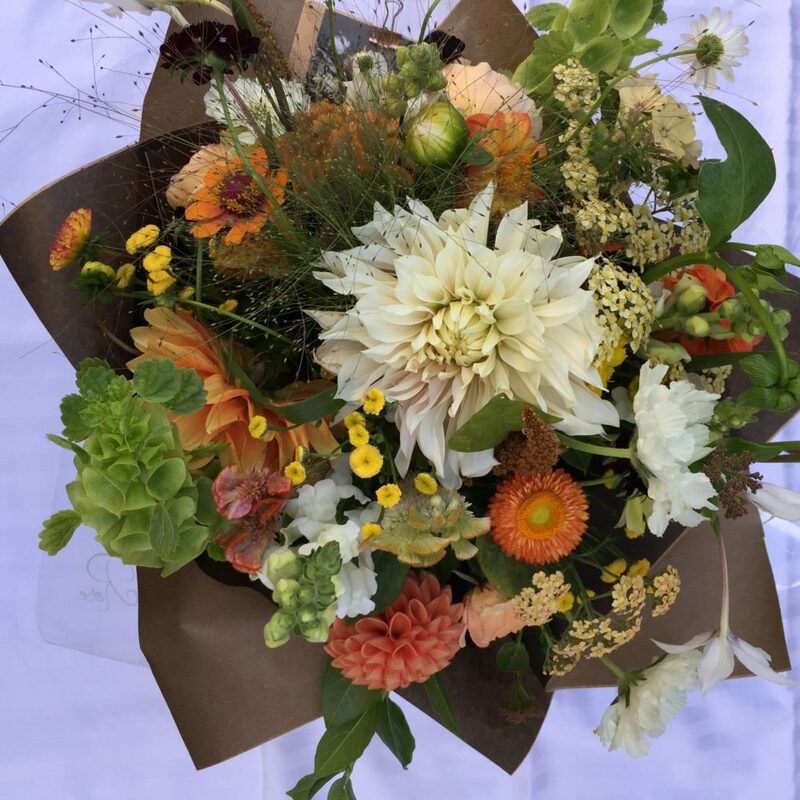 As the seasons change, I’m going to continue making “Garden in a bouquet” bunches getting as many different varieties of flowers and foliages into each bouquet as possible, although of course there will naturally be fewer varieties in the winter months. I think the concept could be extended into funeral and bridal work too. 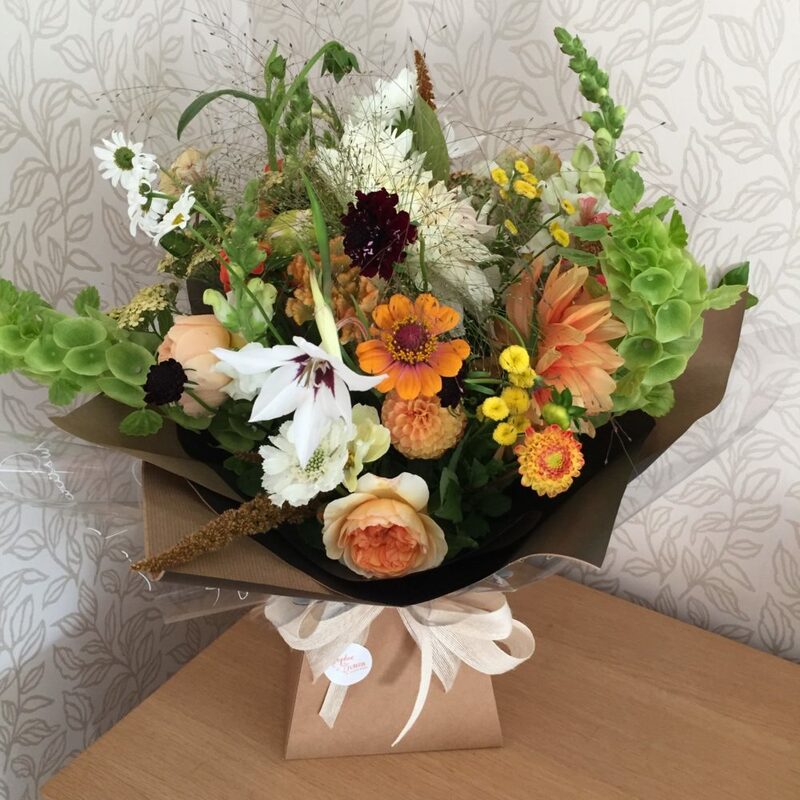 These could also incorporate the client’s favourite flowers for a personal touch. 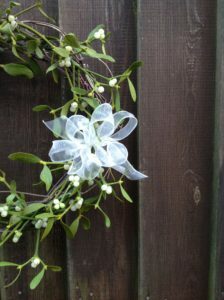 Winter bouquets will be full of glossy foliages and berries whilst in spring, bulbs, hellebores and twigs will prevail. Can you believe it’s mid-August already? At the time of writing summer seems to have disappeared leaving days of showers, wind and torrential rain. Hope sunny days will be back soon. 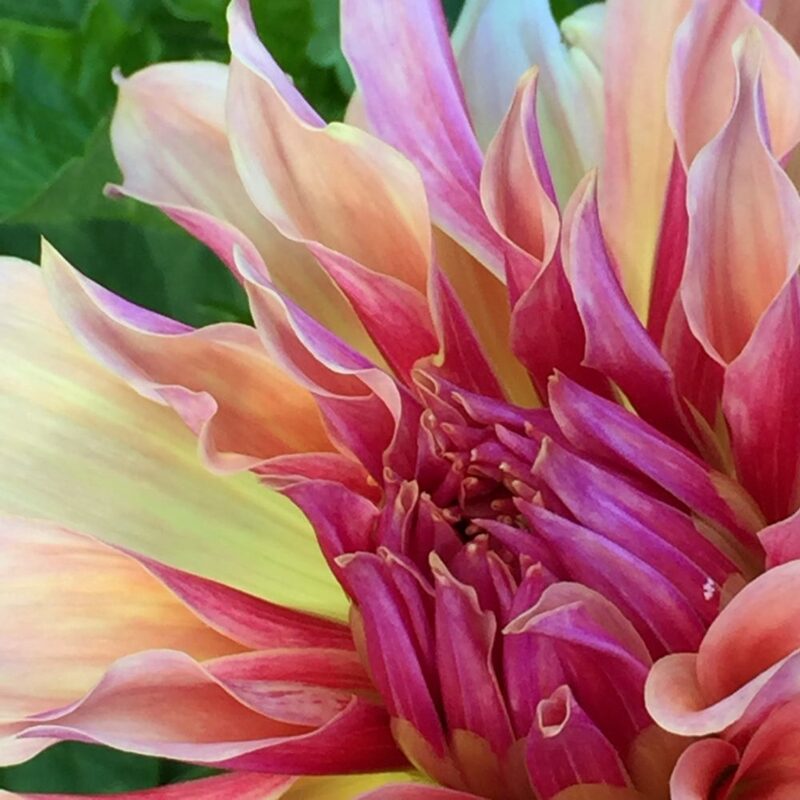 August is the month that British grown dahlias are really blooming their socks off. 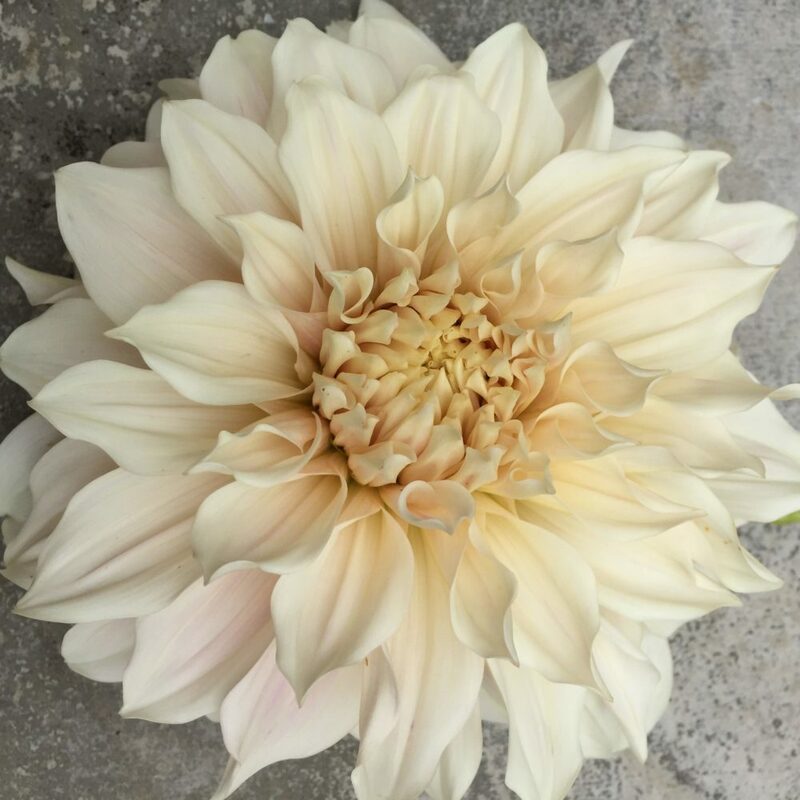 They’re one of my favourite summer flowers because of their many different forms and colours from the huge dinner plate sized Cafe au laits and Labyrinths to the more delicate, tightly packed petals of the pom pon dahlias. Colours include soft whites, acid lemon yellow, all shades of pink, coral and lilac right through to the bright reds, sultry dark chocolatey reds and purples, every colour except blue. 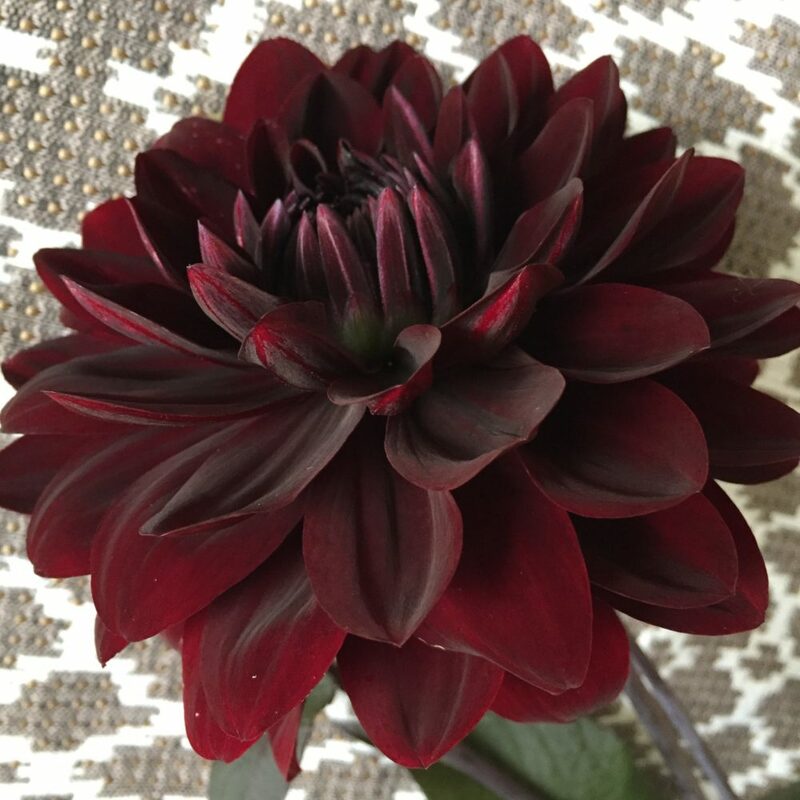 Many have great names too: Linda’s baby, Karma Choc, Waltzing Mathilda, Wine eyed Jill…..
Dahlias are enjoying quite a revival currently with many florists using them in their work for all occasions. They’re vase life isn’t especially long even when freshly picked and well conditioned, usually about 5 – 7 days, but their vibrant beauty more than makes up for that. In the home I think the best thing is to pop them in a lovely vase or jug with a few sprigs of garden foliage and place them somewhere you can see them from your armchair or kitchen window and just enjoy them. This year for the first time we’ve grown some on our cutting patch. I bought the tubers a bit late to be honest and there wasn’t a huge choice left. I only bought a few but was delighted to get some Cafe au Lait, a bridal favourite, and the gorgeous Labyrinth which is orange/ coral/ pink streaked with darker pink. I’m pleased to say all the tubers grew into big strong plants, nurtured in the shed to start with at the beginning of April and then planted out after all the frosts were gone. The bigger blooms can be tricky to use in bridal bouquets but can look stunning in compotes with flowing foliages and other cutting garden goodies such as peachy roses, chocolate cosmos, mint and sweet peas. 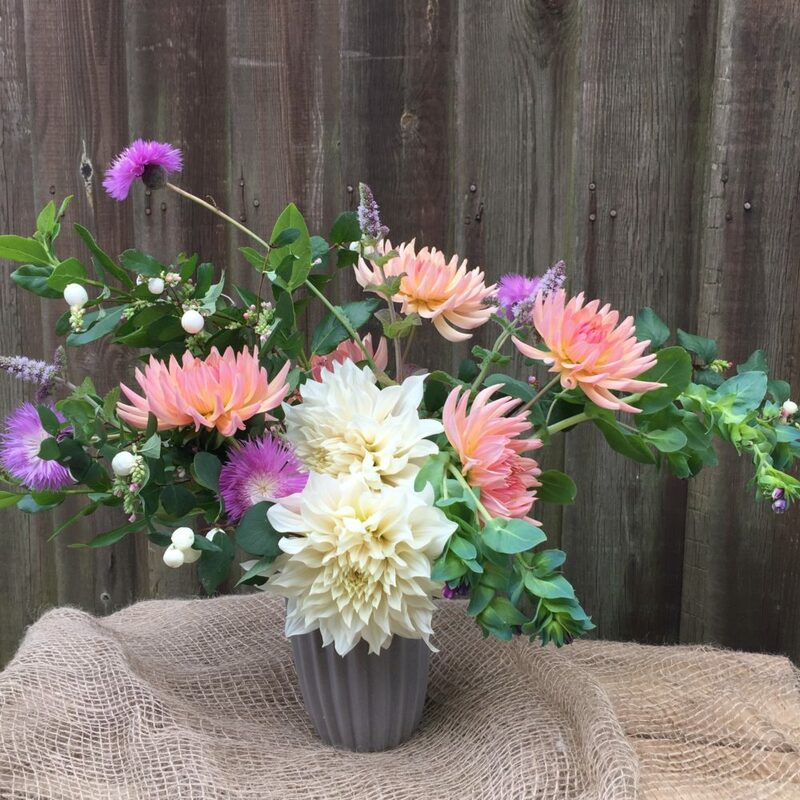 Dahlias have a very annoying habit of growing with their heads turning to bloom in different directions than the one your bouquet or arrangement requires, you just have to work with it as that’s part of their charm! 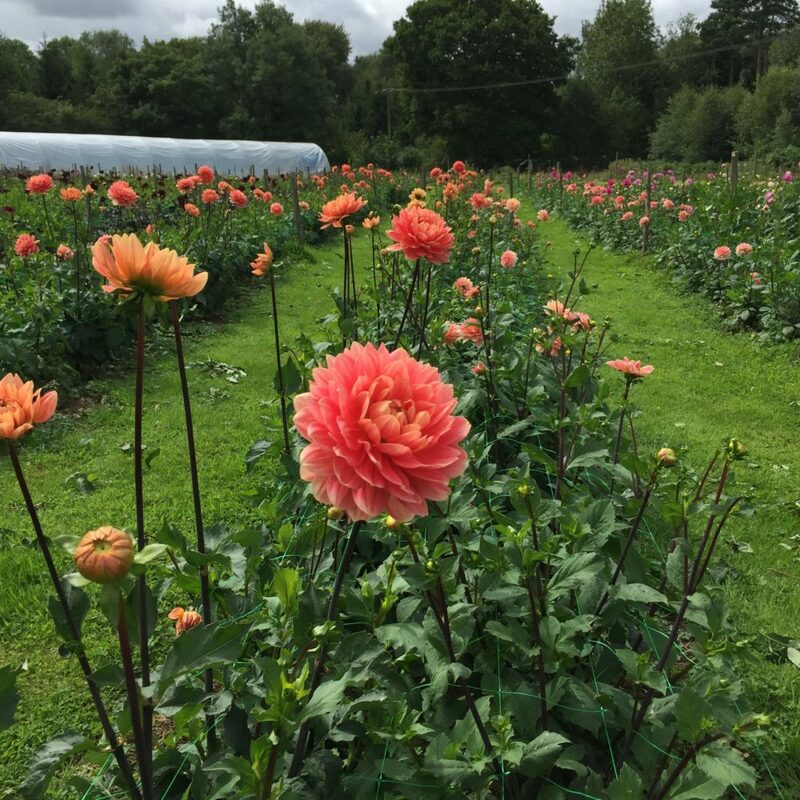 A couple of weeks ago I visited Withypitts dahlias in Sussex to see their farm and to buy a few blooms. It was a sunny day and all you could see all around was row upon row of perfect blooms. Truly a sight to behold! Many of their blooms go to New Covent Garden Market and florists in London to adorn weddings and events all across the city. 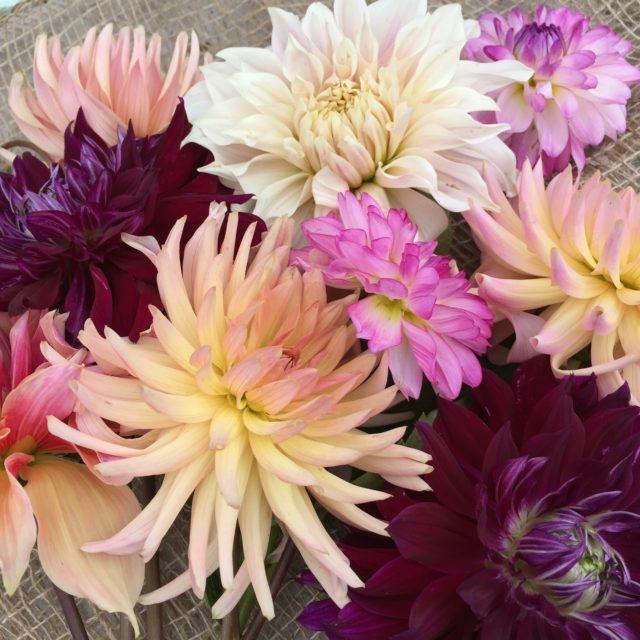 Once the frosts come in October dahlias die down for another year. Some people lift all the tubers and put them into storage for the winter whilst others leave them in the ground with a thick layer of mulch to protect the them. Then in spring they can be split to make more plants and the whole cycle begins again. I’ll certainly be checking out the plant catalogues a little earlier this autumn and make sure I get some different varieties to add to my collection. 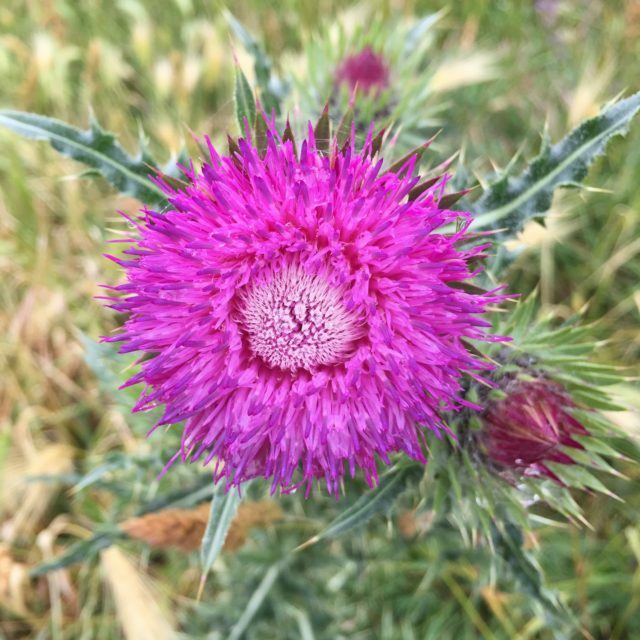 Since my first blog post was about British Flowers Week, I thought I’d continue on the theme of British flowers, this time looking at wild flowers on the beach. Recently we had a “staycation” so we could take our 10 month old puppy on holiday, rather than leaving him in kennels. 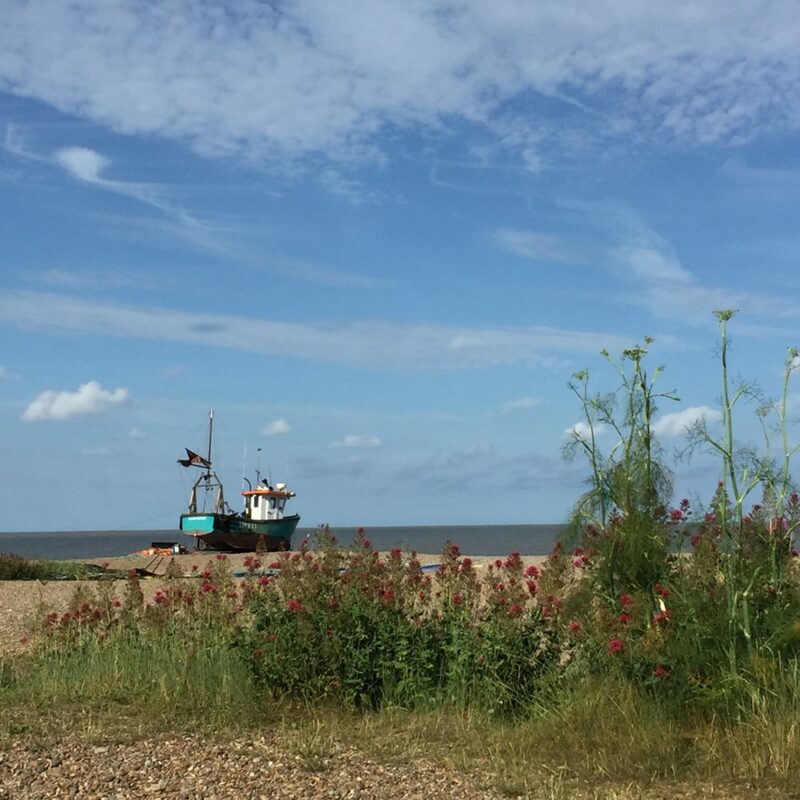 We spent a week in Aldeburgh on the Suffolk coast. Much as I love to hop on a plane and end up somewhere warm, there’s something to be said for driving for just an hour to be on holiday. 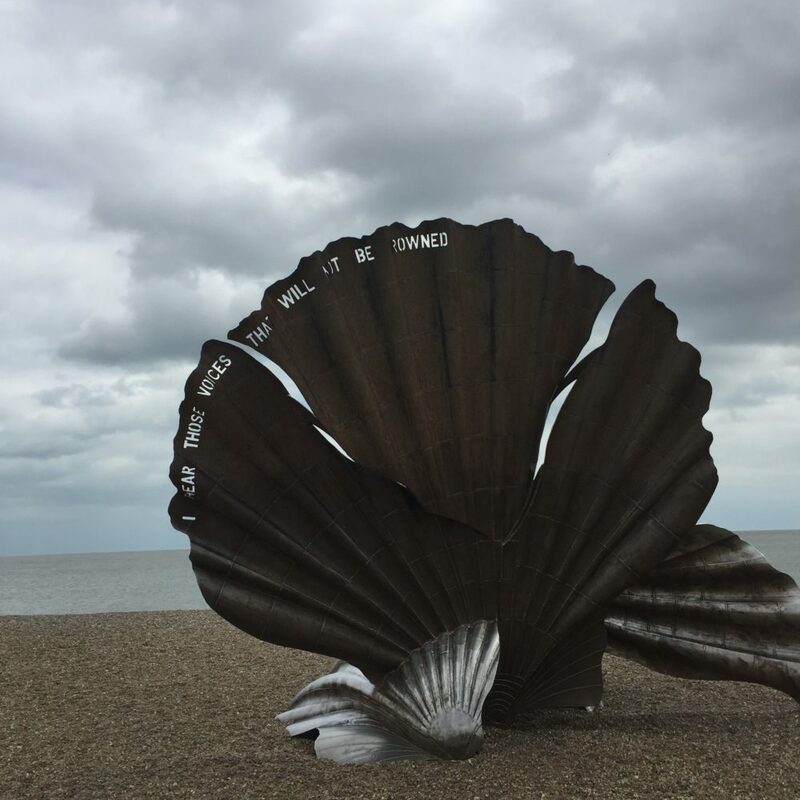 Aldeburgh’s a pretty little town famous for it’s pretty, pastel painted cottages, Maggie Hambling’s scallop sculpture on the beach, composer Benjamin Britten and delicious fish and chip suppers. 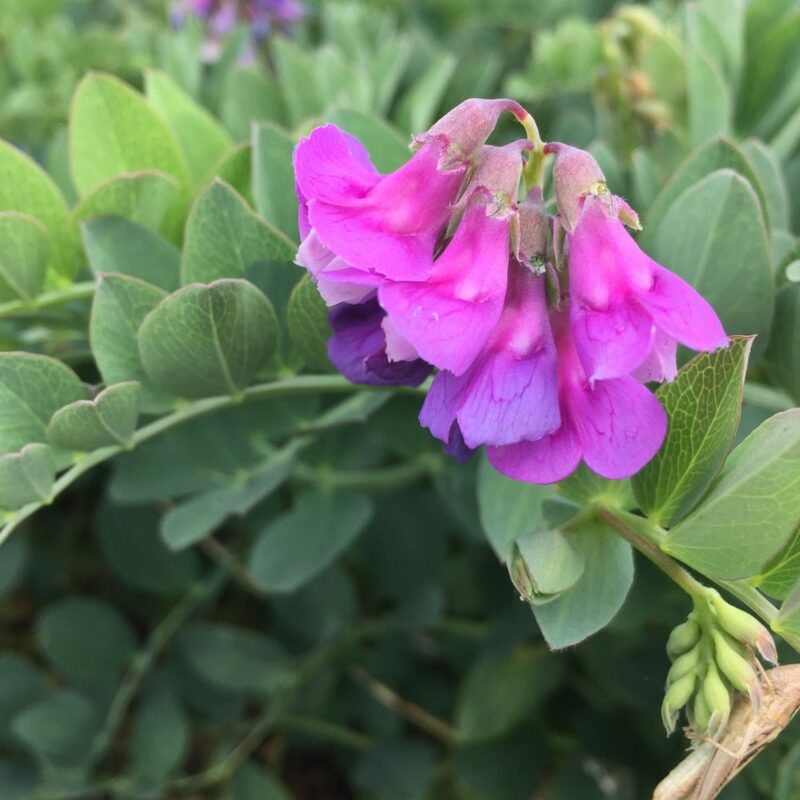 I couldn’t help but notice all the flowers in the town from the hollyhocks, hanging baskets and fragrant jasmine outside the cottages’ front doors, allotments full of sweet peas and sunflowers, to the wild seaside flowers. 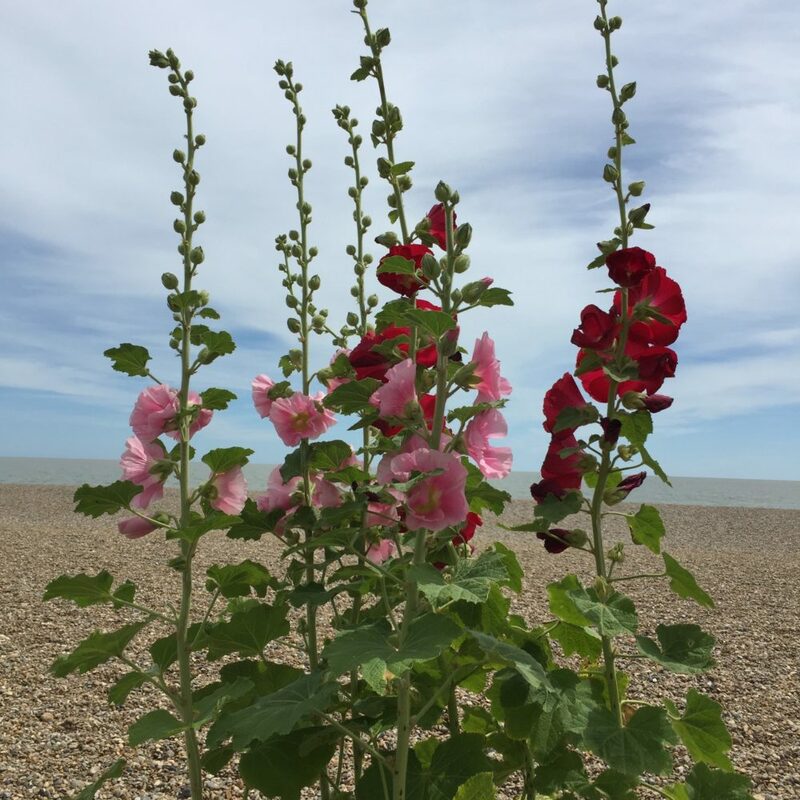 Hollyhocks even grow in the pebbles on the beach, along with many others like mallow. Visiting in late June means that many of the beach flowers were in full bloom. Valerian in shades of pink and red, grows freely in the shingle and any little nook and cranny in walls. 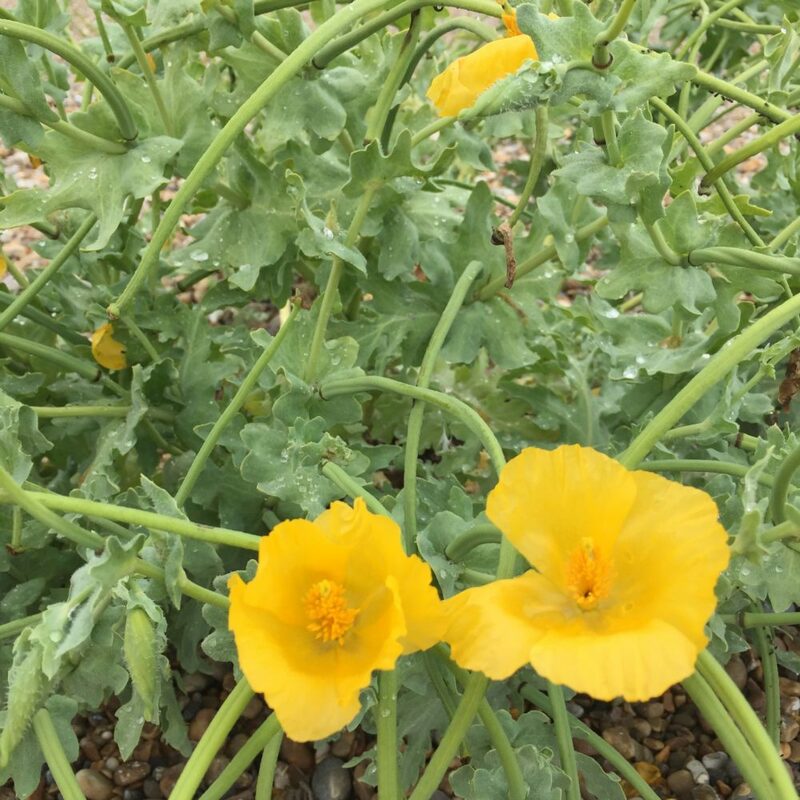 Horned sea poppies with their yellow flowers and long, spiky seed pods grow in big clumps across the beach. 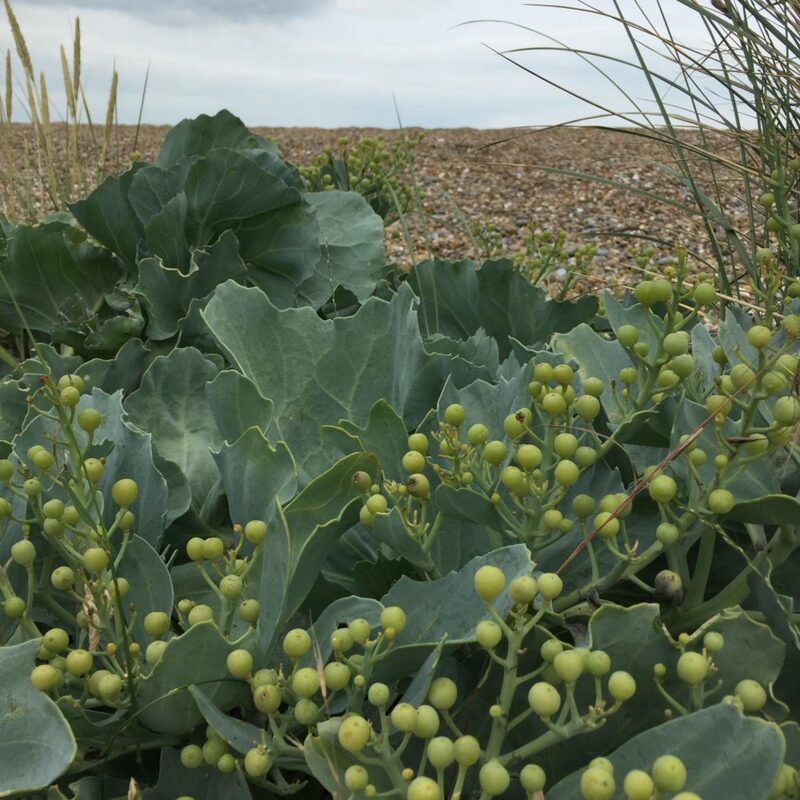 Sea kale with it’s wavy-edged succulent leaves have tiny creamy flowers which later make little berry-like seed pods. Sea peas looking like mini sweet peas grow low down on the beach while fat, pink thistles attract many bees. All of these flowers have their own wild beauty, albeit short lived. One of the reasons I love British flowers, both seaside and garden, is that each one has it’s own natural season when they’re at their absolute best. We can enjoy their transient beauty for a few days or weeks and then they’re gone for another year. Welcome to my very first blog! I’m looking forward to giving you a little glimpse of my flowery world. 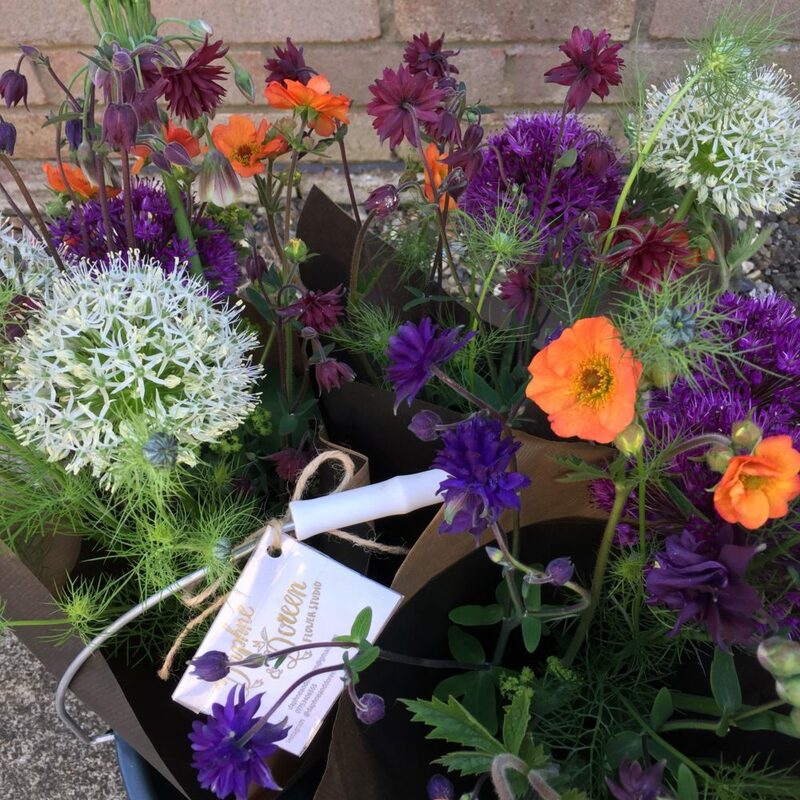 When I started Daphne and Doreen Flower Studio I was very keen to do my bit in supporting the British flower industry as I love to use seasonal flowers. 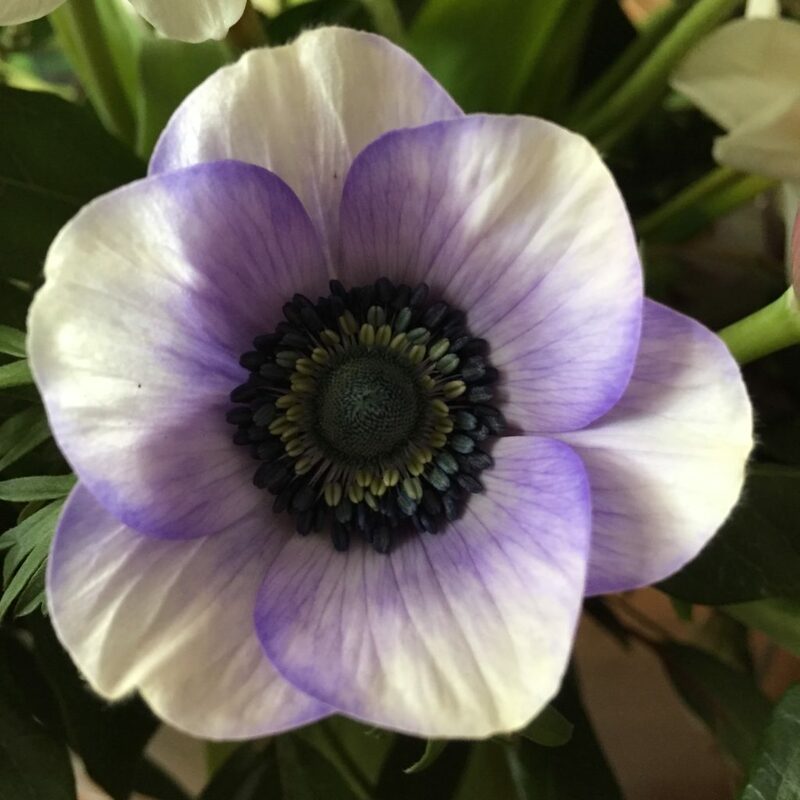 Despite the challenges of the great British climate and tough international competition, British flower growers’ brilliant horticultural skills, creativity and sheer hard work always shine through in the wonderful variety and quality of flowers they grow. They produce the most beautiful fragrant blooms, many of which you will never find in a flower wholesaler. They are super-fresh too as they are often picked one day and delivered the next and there are not thousands of air miles used in getting them to the florist. I usually collect my flowers from the local growers and it’s good to know that the flowers were probably still growing less than 24 hours before. Many British farmers use minimal chemicals in the growing of their flowers so the flowers are pretty much as nature intended. This also encourages plenty of bees and other insects to the farm. It’s lovely to walk the field and see butterflies, hear bees buzzing and birds singing. I won’t say I would never use the imported flowers in my work but wherever possible I will use British. This year my daughter and I have started our own cut flower patch. We started quite late in the season so our first crop will be mainly annuals. It’ll soon be time to sow perennial seeds for next summer and order bulb catalogues for the spring. Hopefully later in the summer our own flowers will supplement what I buy in from other local growers. There’s great satisfaction to be gained from growing your own, be it flowers or veggies. I recently did some freelance wedding work with a local flower farmer/florist and I thought how amazing it must be to flower a wedding with flowers from your own plot. To see a happy bride with her gorgeous bouquet and think “I grew those flowers” must be so rewarding. British Flowers Week is an event started several years ago by New Covent Garden Flower Market to promote British grown flowers and foliages. 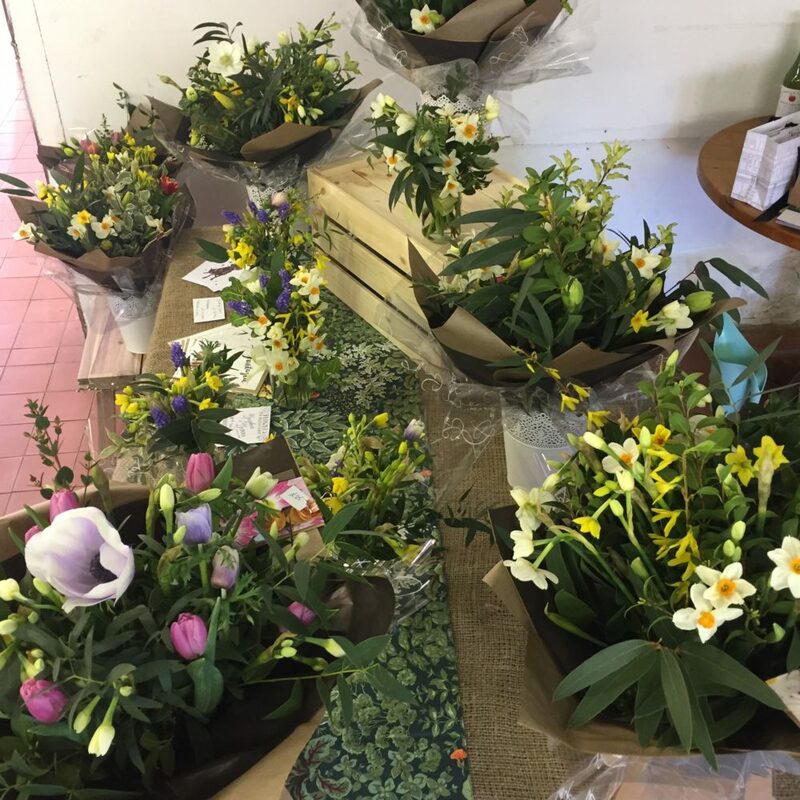 During this week florists and flower farmers all over the UK will be holding workshops and other events to promote British flowers. I will be celebrating the occasion by having a little pop up shop at my local farm shop, Paddock Farm shop in Mulbarton, Norfolk on Friday 23rd and Saturday 24th June between 9am and 1pm. 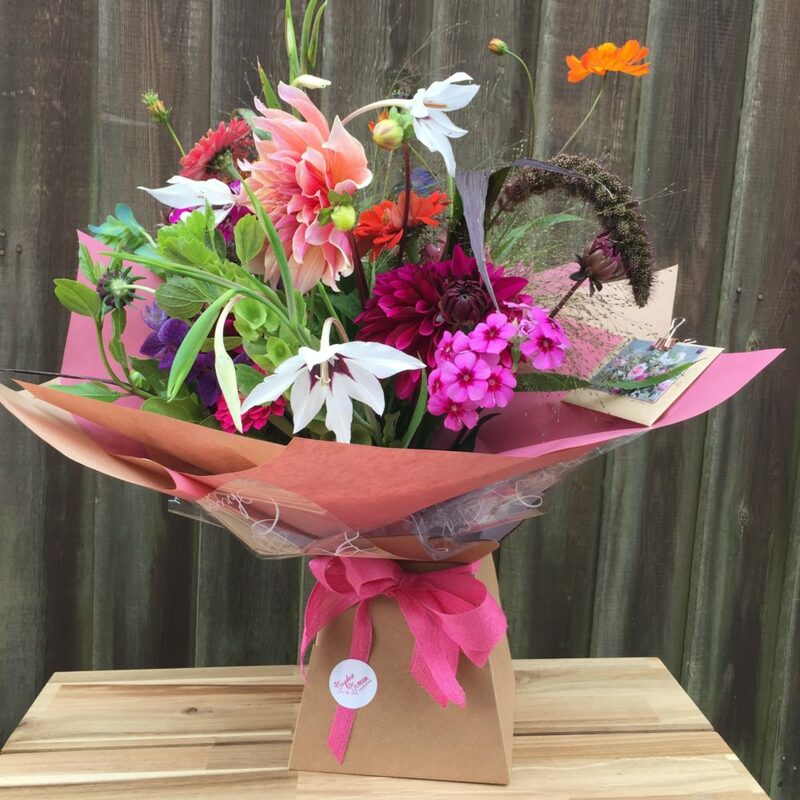 My little bunches are already on sale there each week, and as well as these, I’ll also be showcasing a few other things to give customers an idea of the kind of flowering I do. My flowers will be sourced from local growers and some from Cornwall. I love how British flowers reflect the passing seasons and how fleeting some blooms are. 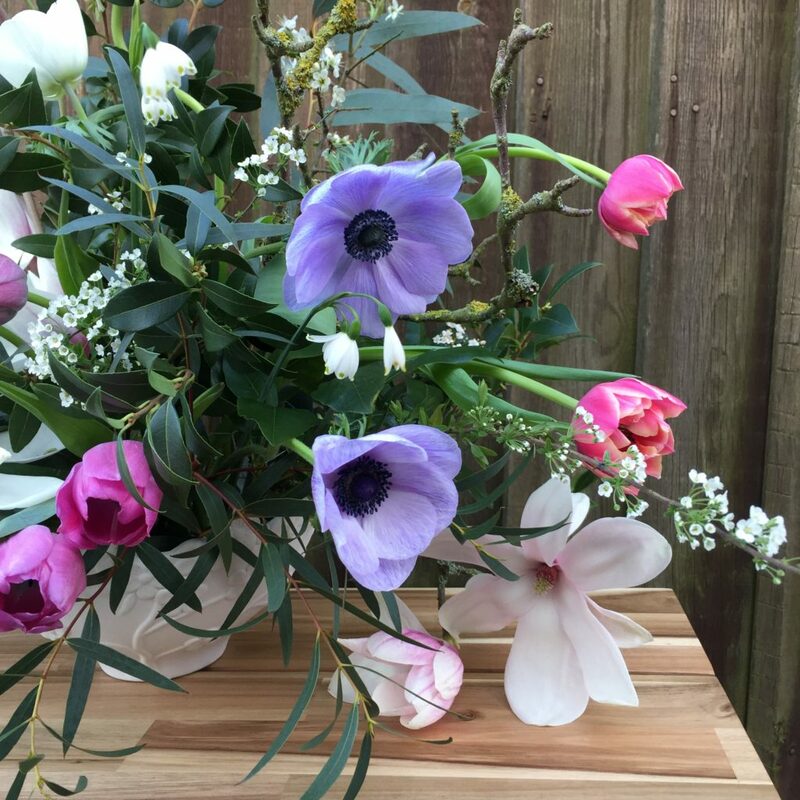 I always feel excited when the ‘first’ of any flower blooms, the first paperwhite narcissi, anemones, tulips, ranunculus, fritillaries, alliums, peonies…. Many of my personal favourites are spring bulbs. There’s so much pleasure in these early flowers which bloom when the days are dark, cold and damp. That little splash of colour and fragrance makes the heart sing and all the hard work on the flower patch totally worthwhile. British flower farming is definitely enjoying a renaissance with plenty of recent press coverage. I think it’s time we florists do whatever we can to bring them to our customers’ attention. I will be doing my best to do this, showing British flowers off in all their beauty. I hope, like me, that you’ll enjoy them.